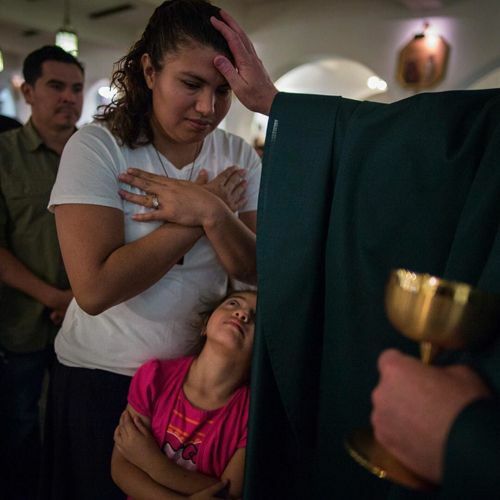 "A parishioner received a blessing during Spanish #Mass at St. Simon Stock Church in the Bronx, which now includes the parish of the former St. Joseph's Church. The two merged this summer after St. Joseph's was closed. In anticipation of Pope Francis's visit to New York, @angelfranco_nyt and @104bx reported on the life of this merged #Catholic parish. Efforts to hold together the congregation raise the question of whether the Roman Catholic Church can minister to New York CIty's poor in an era of diminishing resources. Follow @angelfranco_nyt to see more photos from the story. #popeinny" By nytimes on Instagram.